In a city once dominated by horseshoe courts, a lively group keeps the tradition alive in Beloit. Meet the players at Beloit Horseshoe Club, and discover why, for these players, it’s more than a game — it’s a sport that makes friends from strangers. Over the past few years, Walt Houck has suffered some serious health issues, which have led to numerous hospitalizations. 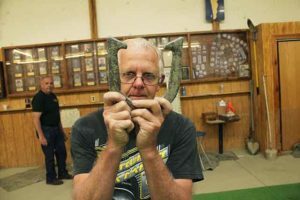 Perhaps the biggest drawback during his recuperation, however, is his inability to spend time pitching horseshoes with good friends at the Beloit Horseshoe Club. That seems to be the consensus among the 90 members from across northern Illinois and southern Wisconsin who make up this club located on the outskirts of Beloit. For many years, the club has hosted local and regional tournaments and leagues, as well as a three-day “Team World” competition that draws players from across the country and Canada. Participants – young and old, male and female – enjoy pitching horseshoes not only for the spirited competition, but for the companionship. The same is true in other leagues, including the Beloit Moose Club, South Beloit Legion and the Roscoe VFW. There was a time when horseshoe courts dominated the city of Beloit. Fairbanks Morse, Beloit Corporation, Besly Welles and Warner Brake are among local companies that built horseshoe courts on their properties to provide their employees with recreation. Many homeowners built courts in their backyards. In 1967, horseshoe enthusiast Don Goldsmith built four regulation clay courts on his land in South Beloit. They were used every Tuesday and Saturday for about 15 years. There were no organized leagues at the time, but an annual doubles tournament was held each fall, attracting pitchers from Janesville, Milton, Edgerton, Rockford and Freeport. In the early 1980s, the Beloit Horseshoe Club was created and four officers were named: President Norval “Bud” Renley; 1st Vice President Ken Lovaas; 2nd Vice President Harold Laws and Secretary/Treasurer Earl Paulson. In 1985, the club was sanctioned by the NHPA, the U.S. governing body of horseshoe pitching. More leagues were added and sanctioned singles leagues began. All members hold current NHPA cards and pay an annual $20 membership fee. “We’ve been extremely fortunate,” says Paulson. “The generosity of our supporters has been incredible.” Seneca “Red” Ferguson, an original member, donated $40,000 in the late 1980s to help the Beloit club build its own facility at 640 Ravine Road; other donors gave as much as $1,000 each. The facility includes a clubhouse, 13 outdoor courts and a six-court indoor pitching facility. The outdoor courts were named in memory of Renley, nicknamed the “Horseshoe Engineer,” who designed and constructed the courts before his death in 1991. Horseshoes is played outdoors or indoors, between two people or two teams of two people using four horseshoes and two stakes set in a sandbox or clay area. Players take turns tossing the shoes at the stakes, which are placed between 30 and 40 feet apart. There are two ways to score: by throwing “ringers,” a horseshoe that encircles the stake, or by throwing the horseshoe closest to the stake. NHPA-sanctioned games are generally played to 40 points, or a shoe limit of 40 or 50 throws. Paulson started pitching horseshoes 30 years ago, when he discovered he didn’t like bowling. In the club’s arena, shovels of various sizes and shapes lean along the walls. Water-filled Tide bottles line shelves. Each pit is filled with blue clay, a rubbery material that league members take turns shoveling between games. Dust from the clay clings to worn hands and T-shirts, but no one seems to mind. Electronic scoreboards hang from the walls, as do the framed POW and MIA military flags donated to the club by Houck. The Wisconsin Horseshoe Hall of Fame is here, too – photos and memorabilia recognizing the state’s top players of yesteryear. Among inductees is the late Earl Ramquist, the only Beloit native to win the Wisconsin State Tournament, a feat accomplished in 1955. He was an employee of Fairbanks-Morse who began pitching horseshoes in 1940. 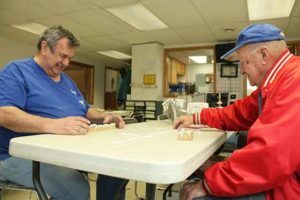 On a recent Monday morning, the loud clatter of horseshoes banging off stakes echoes throughout the arena, as does hearty laughter from retired men who participate in the Monday Morning Old Timer’s League. Pitchers stand behind pits, patiently waiting their turns. Most hold long iron hooks used for picking up horseshoes – easier than repeatedly bending over. The men rib each other about one thing or another, from horseshoes to their favorite sports teams. League play is held year-round at the Beloit Horseshoe Club. There are singles, doubles, afternoon and evening leagues. Outdoor play typically begins in May. There are leagues for boys and girls ages 5 to 9 and juniors ages 9 to 17. Paulson says the club’s oldest participant is 98. In the late 1980s, the organization started a women’s league. Georgia Beebe, Barb Ramquist and Ann Van Tassel organized it and kept statistics, according to Paulson, who doubles as club historian. Women from Rockford, South Beloit and Janesville came to Beloit to pitch horseshoes. Some of the ladies considered it a nice change of pace from bowling. Beebe, who lives in Rockton, Ill., was introduced to the sport by her grandfather and uncles, long before she and husband Ken joined the Beloit club. A women’s league existed for a few years before its members became too busy elsewhere. Beebe credits Paulson with bringing male and female members together, but notes it was an adjustment for club members. The Beloit club hosts several events during the year, including the Autumn Harvest Tournament in November and the Snowflake Tournament in December. There’s the annual Red Ferguson Classic in March, and a Spring Fling in April. Pitchers come from all over the Midwest to play in the tournaments. In 1989, the Wisconsin State Tournament was moved to Beloit, thanks to the club’s reputation for running successful events. Beloit has hosted the state event four times, at the Edwards Activity and Sports Center at Telfer Park, which accommodates more people than the Beloit Horseshoe Club. Each May, about 18 four-person teams compete on 24 indoor portable courts, for $5,000 in prize money and the title of Team World Champion. “It’s a nice incentive, but they do it mostly for the competition,” says Paulson, adding that organizers are looking for additional corporate sponsors to fund prize money. 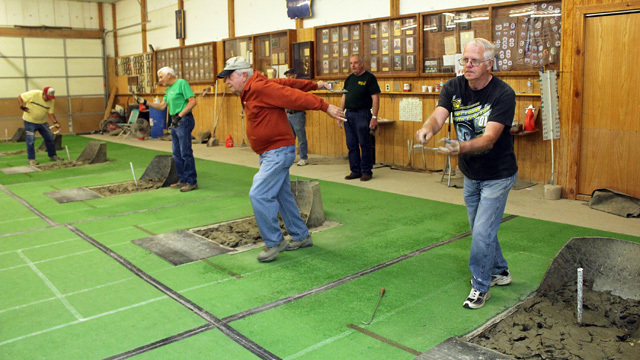 The Team World event brings the best of horseshoe pitching to Beloit. Over the years, the lineup has included professional bowler and six-time horseshoe champion Walter Ray Williams Jr.; 16-time champion Alan Francis from Defiance, Ohio, regarded by many as the greatest horseshoe pitcher of all time; three-time champ Dale Lipovsky of Minnesota; and 10-time women’s champion Vicki Winston of Missouri. The reputation of the Beloit Horseshoe Club has developed on an international scale in recent decades. In the late 1990s, it was recognized by the World Horseshoe Tournament in Kitchener, Ont., Canada. In 2000, “Red” Ferguson was presented with a prestigious achievement award from the National Horseshoe Pitcher’s Association (NHPA). And in 2001, Paulson, the club’s tournament director, was honored for his work in promoting the Team World Tournament. The Beloit club is one of the first in the country to have its own website, featuring tournament schedules, results and Team World coverage, as well as links to horseshoe clubs and organizations in other states and countries such as England, Sweden and Finland. According to Deb Frederiksen, executive director of Visit Beloit, horseshoe tournaments contribute about $100,000 to the local economy each year, since participants visit Beloit for day trips and overnight stays. Last year, Beebe’s 98-year-old father came to watch the Team World competition. When the games were over and the title had been claimed, the victorious team came over to greet the elderly man, showering him with hugs and high-fives. Three days prior, these people had been complete strangers. 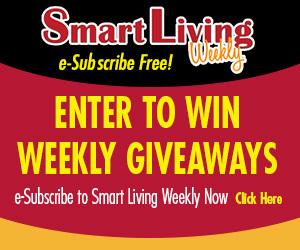 This entry was posted on Thursday, May 24th, 2012 at 11:57 am	and is filed under Features, Top Posts. You can follow any responses to this entry through the RSS 2.0 feed. Both comments and pings are currently closed.